If you think sitting in your Aeron chair for longer than 6 hours is just uncomfortable, guess again. It could be a lot worse than just comfort. While we have become more productive as a society, with the advent of computers aiding our work, physical inactivity has become a high risk factor in contributing to chronic illnesses. We need to sit less, and move more. There are standing desks, but the SoCal startup Moving Analytics is tackling this global problem in another way. Through simple design, extensive sensing mechanism research, and behavioral science principles, Moving Analytics is carving out its own innovative niche in a heavily competitive space by providing a simple solution for highly sedentary people. TechZulu recently talked with Harsh Vathsangam, Moving Analytics’ co-founder and Adelanwa Adesanya (Ade), specializing in Business Development and Product Management. We met at University of Southern California Viterbi School of Engineering’s Robotic Embedded Research Laboratory where Harsh is a Post-Doctoral Research Associate. We spent a morning talking about the transition from being an engineer to being an entrepreneur, having the distinction of being the first digital health startup to emerge from USC Viterbi’s Startup Garage, and drilling down to what really matters in all of our entrepreneurial efforts – listening to consumers. Tell us about your startup Moving Analytics and your app Movn. What problem are you trying to solve? HV: Our current focus is helping people get up and move more, and that’s why we created Movn. The reason is this – if you look at sedentary lifestyle the world over and not just in the United States, approximately 2 out of 3 people don’t meet even the minimum requirements of physical activity per day. Three and a half million people die because of chronic complications developed as a result of sitting too much. One of the best things that you can do for your health, and one of the simplest things you can do – is replace your sitting time with activity time. The broader goal of our company is to provide people with actionable information to lead healthier lives. At the end of the day, most people don’t have time to comb through large amounts of data, so we take all the data that you generate just by living, and analyze this data. We then give you interesting bits of information and interesting guidance throughout your day to help you lead a more healthier life. So should we be standing up right now? HV: Ideally we would be walking. HV: Usually with meetings, I try to make as many of them as walking meetings as possible. HV: The people who we are targeting are office workers who are working 9 to 5 jobs and are not including physical activity in their daily lives. The main issue that we see is that the habits to get up and move every day are not ingrained in their daily lives. And that’s for a variety of reasons – they have long workdays, they have deadlines that they have to complete, they have responsibilities outside of work. They’re just really busy. They forget about staying healthy, and moving. Where we come in, and where we can help, is we say ok, so you have your life, but let us analyze your existing behaviors and give you suggestions. We use behavioral science principles to help you develop good habits. If you set a moving activity goal for yourself, Movn will adjust itself to help you achieve that goal. If your goal is to hit 30 minutes of movement per day, and you make your goal, Movn will not buzz you anymore. If your goal is 60 minutes, Movn will keep buzzing you until you hit your goal. The key thing also is that our solution is personal – our solution is personalized to your activity goals, when you want to be nudged, what you want to be nudged with, what motivates you. What motivates you might be different than what motivates me. What we are trying to do here is we are using our expertise in machine learning and sensing capabilities to build a model about you that is tuned to you. Today’s digital health consumer has so many choices on the market. How is Movn different than your competition? HV: Our main competitive advantage is the idea of personalization. We have built this into the platform’s DNA from the very beginning. 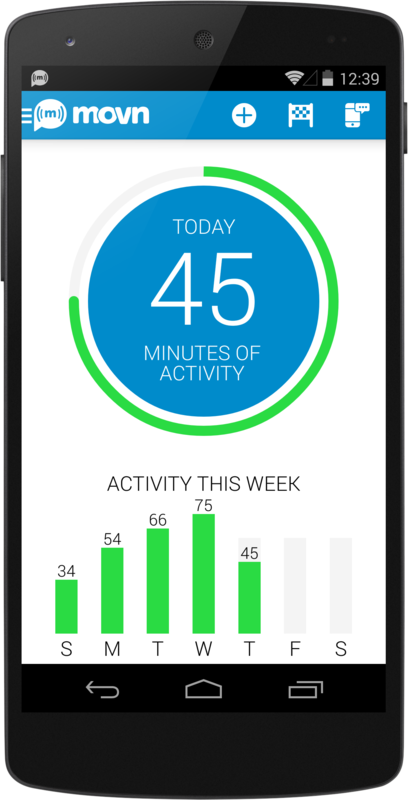 Movn is a personalized app — we are building out a physical activity model for you and a personal system for you. The sensing technology, too, is unique to our solution. It is built out of 5 years of research at USC. And our target market is different than others in the space. We are specializing in older adults who are leading sedentary lives. AA: Most product and companies in the space today are focused on young, fit people who are already active. When a consumer uses a Nike Fuel Band, he is using this tracker to optimize his athletic performance, but for the vast majority of consumers who need to be active for health reasons, they just need to stop sitting and move more. HV: I would also add one more thing — we have consulted with neuroscience professionals here at USC, and they have informed the development of behavioral science models that we have built into our platform. A lot of our product that we are building is based off of sound science principles that have been validated in different populations to build habits. You recently conducted a pilot study. Can you share with us how the learnings of this pilot study impacted your strategy? HV: We wanted to run a feasibility test – to see whether people were actually motivated by the solution and to see whether or not people used it. We wanted to take an extreme case – such as people who have never used smart phones and look at whether or not they could still use Movn. There were two centers that we worked with. We gave people what was then the current version of Movn and we established that Movn would track their physical movements. We also set up a competition between the two centers. Whichever center had the most aggregated activity minutes at the end of the 3 weeks won the competition. The population that we tested this on were people who were ages 50 and older. This was run out of USC? HV: It was a research study that was conducted through USC, but the sites were at the Oasis Active Adults Community and we also worked with the Front Porch Center for Innovation and Wellbeing. Before we did the study we did a lot of research to see how best we could show the data. What we discovered is that we should use good color combinations, make everything high contrast, keep everything very simple, avoid hierarchies and menus. A lot of apps these days have so many features that it’s very confusing. We just wanted to tear everything away, and think about the problem — what do people care about? It’s just about being active. We had a pretty simple screen, and it had a circle, and it told you how many minutes you were active. The circle would turn green once you hit your target. We received some really good results and on average the participants rated the app 4.5 to 5. They thought it was really easy to use. AA: Most of the people who used the app during the pilot study were in their ‘70s. HV: Yes, the oldest was 89 years old. AA: And they knew how to use it. We thought if they could figure out how to use the app, then the majority of the population could as well. If we could get this segment of the population to work with it, then the app could work for just about anybody. So that pretty much helped to influence our design. And the funding for this study came through the PhD program at USC? HV: Actually, we had a little funding from the National Science Foundation. The National Science Foundation has this program called the Innovation Corps (I-Corps). Explain a little more about the I-Corps program. HV: It is a 10-week program and it is really intense. We had to meet 15 users per day, run user studies and try a lot of different things. The program helped us to really understand what our product market fit is. They really encourage the lean startup methodology as the way to bring your product to market. AA: In the beginning your idea is a hypothesis and you need to validate it. So you write your hypothesis on what’s called a business canvas model and then you go talk to your potential customer. Basically every conversation you have is either validating or invalidating your hypothesis. We had to talk to at least 100 customers throughout. It was really fast. HV: The I-Corps mentors are very experienced entrepreneurs and they will just tell you straight up what they think of your results. It helped us build domain expertise in the space just by talking to all these experts. AA: It was really hard that first year, trying to talk to people. If I had a call with a potential user, I would try to strategize the call for 30 minutes and try to figure out what would we want to talk about because it was really weird, calling up random people and asking them for their opinions. Now it is very easy, and I’ve learned how to get the necessary information that I need out of a consumer. HV: I have a simple way to do user research now. I go to Starbucks and I buy $20 worth of gift cards. I approach someone who is working at Starbucks and I ask, “Can I have 10 minutes of your time?” I ask the person to test the app and to give me their feedback. I then give them a Starbucks gift card for their time. You have also talked about integrating the Movn solution with the clinical side of health care. Share with us how you are developing your strategy of introducing the Moving Analytics platform to providers. AA: Usually the patient goes into the clinic and the doctor asks the patient, “Did you stick to your activity regimen?” And the patient gives a number. Clinicians are going to be designing treatments based on this number, which is most likely inaccurate. 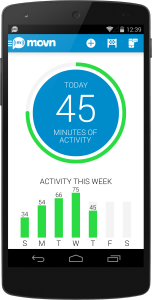 So for patients, we can give them Movn and track their physical activity, record their data, and motivate them. At the same time we can translate the patient’s data to the clinicians and they can see the patient’s activity patterns and see how active they really are. Clinicians can get much more detailed health information just by looking at your data, and they can make informed recommendations. HV: Data gives you that feedback of whether your behavior matches your expectations. And that’s the reality. That’s the other side to this – self-reflection. This is another important aspect to our solution. Let’s talk about your accelerator – USC’s Viterbi Startup Garage. Why did you apply? HV: We were at a stage where we had the technology but we needed help building the business. We knew that we are good engineers but we wanted to become better entrepreneurs. That was one of the main things that motivated us to apply. If you could advise applicants before they applied to an accelerator like Viterbi’s Startup Garage, what would you tell them? In order to get the best experience out of the process, what advice would you give? HV: Different accelerators have different strengths. I would say one important thing to understand is the accelerator’s ecosystem. Is it the right fit for you? That’s one thing. Or, if it’s not the right ecosystem, what value do you get from joining the accelerator and is it in alliance with your strategy? The other thing that I would say is when you apply, you need to have data that has been validated on some potential customer. It doesn’t have to be your final customer or even your most ideal customer, but your data should be validated in some way. At least try to get someone to pay something for your product, or at least have a commitment that they will pay something for it. I think that’s important. AA: You should also have some sort of prototype of your idea, rather than just a concept. I think you also have to go in with an open mind, a thick skin and ask a lot of questions. Talk to everybody you get an opportunity to talk to because at that stage of your business, it is all hypothesis. You need input and opinions. What would you single out and say has been the best lesson that you have learned about being an entrepreneur? And what would you say has been the best lesson that you have learned about yourself? HV: Best lesson from an entrepreneur perspective…. there are so many! I would say, put your customers first. Look at the people who are paying you and listen to them. That’s a lesson that I have learned. You don’t have to listen to their solution, but you do have to listen to their problem. You have an advantage that you talk to many people, but they only talk to you, so you have other perspectives to rely on. Personally, it has been a huge growth journey from being an engineer to being an entrepreneur. I have learned that I have an immense respect for people who put solutions in the market and sell them. For me, that is where the impact is — putting solutions in the hands of people. The fact that consumers are using your solution to make their lives better is immensely fulfilling. And the fact that consumers spend many hours a day earning their money, and they are willing to give this money to you in exchange for your solution, is really impressive. AA: I think what I have learned is that building a business is about finding a problem that is big enough and that lots of people have and that people are willing to pay for. That’s fundamentally what it is. You have to really think on that level – what is the real problem? That’s where your engineering skills come in and you can be very creative in solving that problem and developing a solution to that problem. HV: One additional thing that I would say is that I think the key in all of this is persistence. One of the best things that I think you can do for yourself as an entrepreneur is to put yourself in a position where you can keep trying to attack the problem while still paying the bills. I think that’s what really celebrates a successful business from a failed business — just the ability to last the longest and be a success. Honestly, I think that’s the key — continuously trying to improve the business model and surviving long enough to be successful. Jessica spent a few years climbing ladders at multiple corporations, but today, you can find her attending startup events, listening to pitchfests, and exploring disruptive innovations. Jessica likes to write about startups, entrepreneurialism, and the underlying motivations behind both.